This Lord Carnarvon Timeline has been developed to provide a 'snapshot' of the famous people and events during this historical time period featuring the Pharaoh Tutankhamun - King Tut. Important dates in a fast, comprehensive, chronological, or date order providing an actual sequence of important past events which were of considerable significance to the famous people involved with the discovery of the Tutankhamun Tomb via the Lord Carnarvon Timeline. The discovery of the tomb of Tutankhamun and its fabulous wealth has made Tutankhamun one of the most famous Ancient Egyptian Pharaohs and why the Lord Carnarvon Timeline is so interesting to everyone interested in the Ancient Egyptian history and the life, and death, of Tutankhamun. 1922 5 November 1922: Carter cables Lord Carnarvon: "At last have made a wonderful discovery in Valley; a magnificent tomb with seals intact; re-covered same for your arrival; congratulations." 1922 26 November 1922: Carter makes the famous "tiny breach in the top left hand corner" of the tomb doorway accompanied by Lord Carnarvon and his daughter Lady Evelyn Herbert. Carnarvon asks him if he can see anything, Carter replies: "Yes, wonderful things" and goes on to say: "as my eyes grew accustomed to the light, details of the room within emerged slowly from the mist, strange animals, statues, and gold--everywhere the glint of gold." 1923 9 January 1923: Lord Carnarvon then strikes an exclusive deal with The Times newspaper. Carnarvon had signed a £5,000 contract with the London Times, plus 75 percent of all profits from the sale of Times articles to the rest of the worldOther journalists are furious about the deal, especially Weigall from The Daily Mail. Howard Carter, argues with key members of the excavation team and some are sacked. He then argues with Lord Carnarvon regarding his attitude and his 'friendship' with Lady Evelyn. Egyptian nationalists demand that the treasures of the tomb are sold to pay off Egypt’s national debt. Carter and Carnarvon again quarrel about their individual rights of disposal of the treasures. Carnarvon wanted to keep all rights. Carter wanted the contents of the tomb to be kept intact in the Cairo Museum although insisted that Lord Carnarvon should be generously compensated by the Egyptian government. 1923 5 April 1923: Lord Carnarvon dies in Cairo of pneumonia and septicaemia after nicking a mosquito bite with his cut-throat razor. 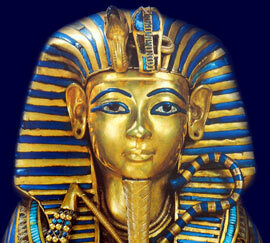 This sparks speculation by the press about the Curse of the Pharaohs. 1923 Lord Carnarvon is buried in a tomb located within an ancient hillfort overlooking his family seat at Beacon Hill, Burghclere, Hampshire.